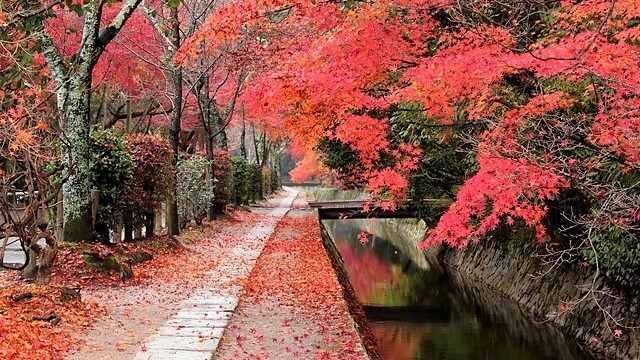 People from all over the world gather to Kyoto in autumn to see the famous autumn leaves of this ancient capital. 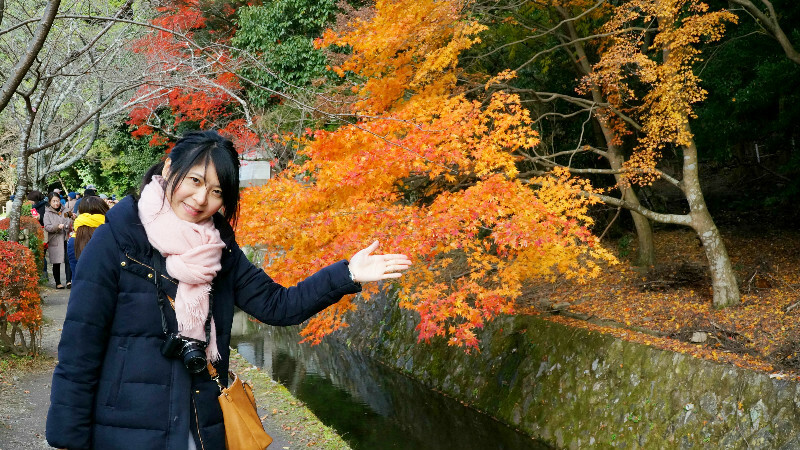 But there are so many places in Kyoto to see autumn leaves that sometimes it’s hard to decide where to go to, but luckily Sharing Kyoto is here to help you. And we have even decided to put in some great places to have some great Japanese cuisine, so you can enjoy autumn by both viewing beautiful nature and eating seasonal cuisine from the land of the rising sun. Start your day from the famous Nanzen-ji Temple. 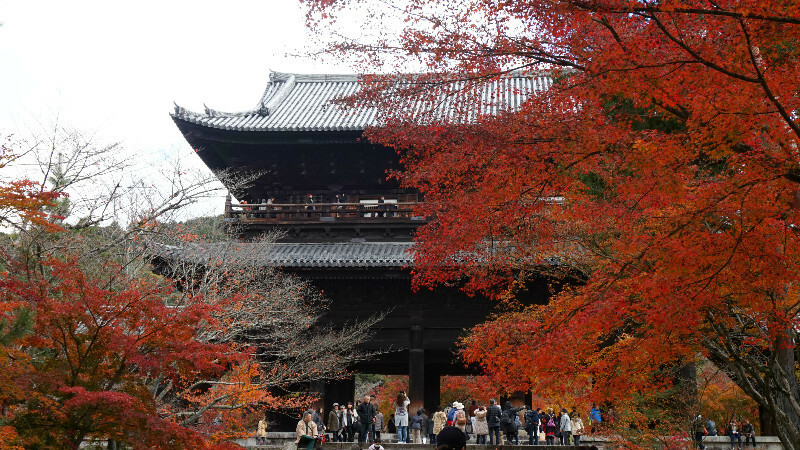 The huge Sanmon Gate greets you at the temple, and the path leading to it is lined on both sides with autumn leaves. It’s actually possible to climb to the second floor of the gate from where you get to see all of Kyoto below you. The temple is only a 10-minute walk away from the closest subway station, Keage, and it’s so big that even though it’s popular, it won’t feel that crowded. Nanzen-ji is not only famous for its temple buildings, but also for this aqueduct that goes through the temple grounds. 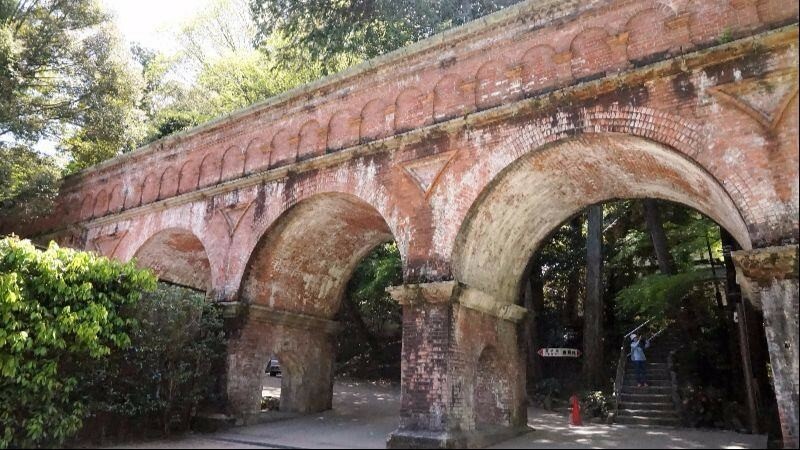 This aqueduct was built over 100 years ago to bring water to Kyoto from Lake Biwa, and it was built in this classical Roman-style so that it would fit in better with the historical temple buildings. Nowadays it’s THE spot in Kyoto for kimono-clad young women to have their picture taken. 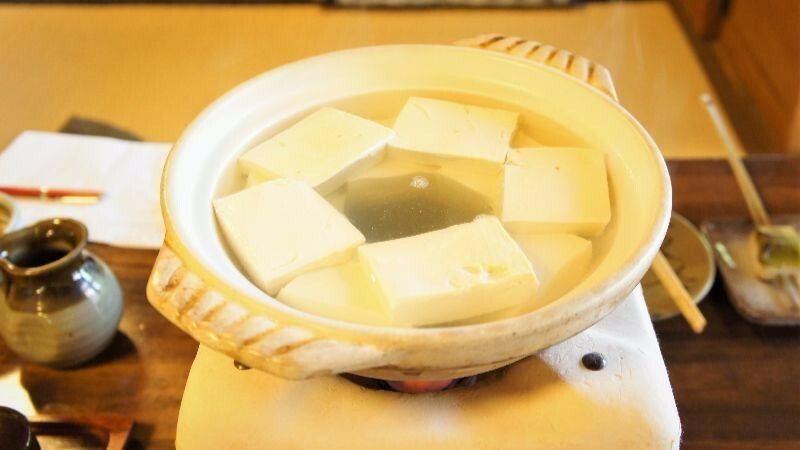 Nanzen-ji is not only famous for its autumn leaves and cherry blossoms, but also for its yudofu. There are many yudofu restaurants in this area offering this Kyoto-specialty of boiled tofu, but one oldie and goodie is Okutan Nanzenji. The tofu you get at Okutan is so soft, so rich in taste, and so refined that at first you should just try it as-is. Then you can try to have it with some bonito flakes and green onion to enhance the flavor even more. The fragrance of the tofu is also surprisingly nice, and it’s just a Kyoto-taste you have to try at least once when you’re in this ancient city. Eikan-do, or as it formally known, Zenrin-ji Temple, is a temple that comes as a set with Nanzen-ji Temple when talking about autumn leaves. 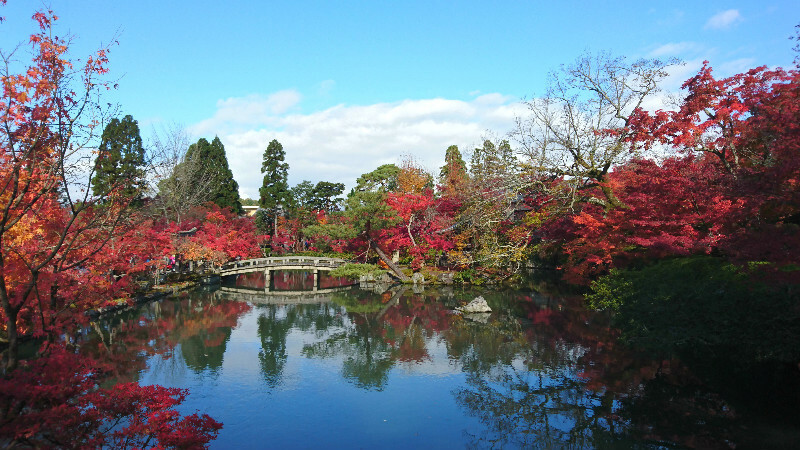 The temple is so famous for them that it’s often called the “Eikan-do of the autumn leaves.” There are around 3000 maple leaves at the temple, and the sight of the autumn leaves reflected in the pond surface is incredibly beautiful. What is special about Eikan-do is that the temple grounds are everything but flat, and you have autumn leaves in layers on the hills of the temple. Because the temple grounds are really vast it may take some time to see it all, but it’s all worth it. From Eikan-do Temple you can walk on the Philosopher’s Parth toward Kinkaku-ji Temple, and enjoy the beautiful autumn leaves on the way. 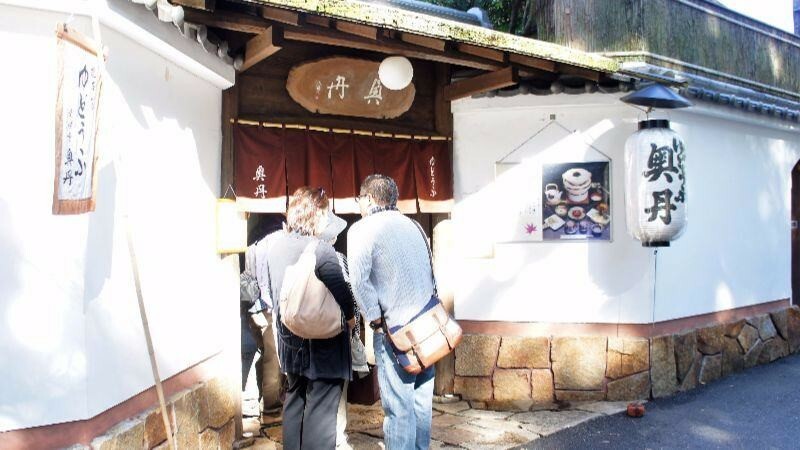 On the way there are also other temples and shrines, like Nyakuoji Shrine and Honen-in Temple. The path is named Philosopher’s Walk because the Japanese philosopher Kitaro Nishida used to take walks here, and if you go early in the morning before most people get here you can still get deeply absorbed in your thoughts like Kitaro used to do. There are also many shops. If you look down at your legs you also get to see autumn leaves on the ground, almost like a red carpet. While it’s beautiful, it also means that autumn is ending and winter is coming, making you feel both glad that you got to see this, and a bit sad because this is going to end soon. Yojiya is a cosmetics shop from Kyoto famous for its blotting paper and because many of its products are also used by geisha and maiko. 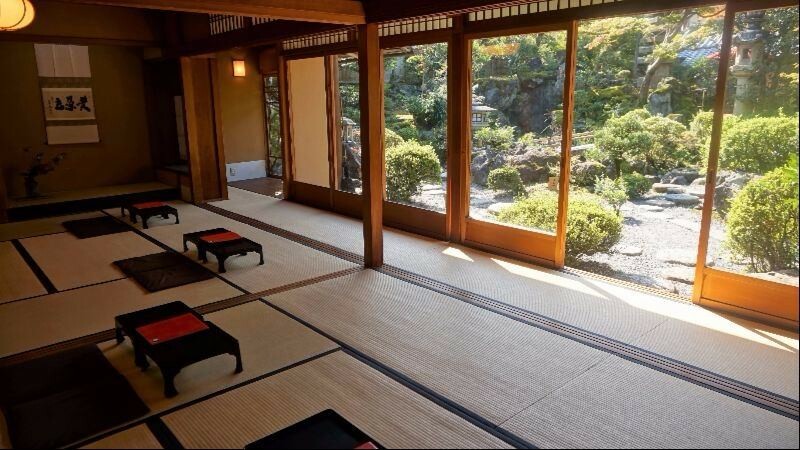 They have a café and shop near Ginkaku-ji Temple which even has an authentic Japanese garden, so you can sit on tatami mat while looking at a beautiful Japanese garden. This is a great experience no matter the time of year, but even better if you also get to see autumn leaves at the same time. 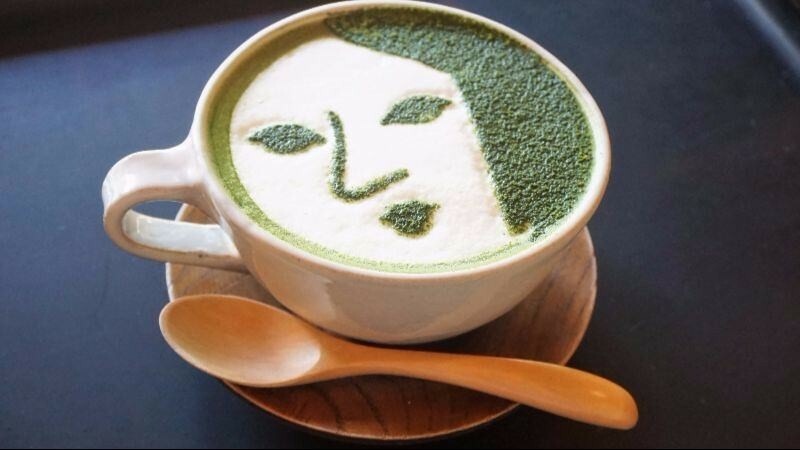 Yojiya is famous for their logo that has a woman’s face on it, and if you order a matcha cappuccino at their Ginkakuji café, you get this logo on the cappuccino. The crema on top of the cappuccino is thick and creamy, and the cappuccino is not too sweet. A taste of happiness! 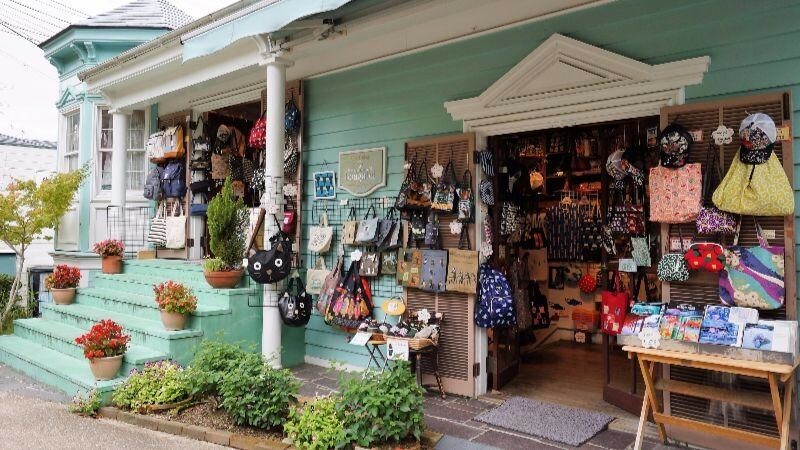 Bougatei is a Japanese zakka store, meaning that everything it sells is cute and fashionable. This is a great place to get some souvenirs; they sell metal frame purses, hair ornaments, and everything in between and some. 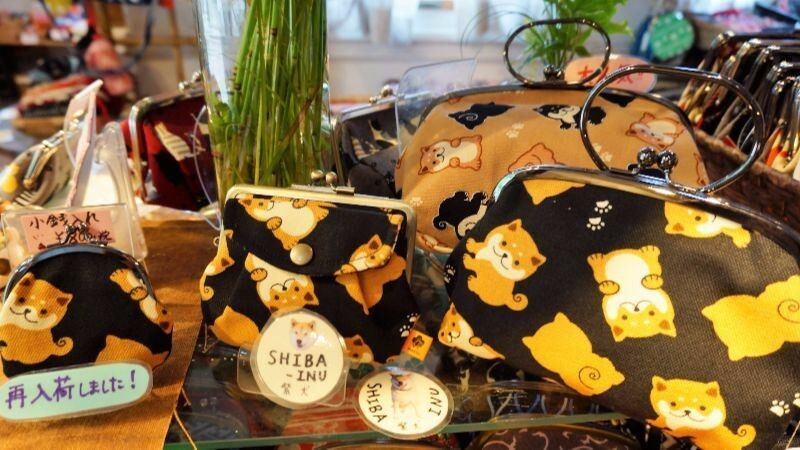 But their most popular products are these purses with Shiba dogs on them. They are just so cute that it’s really hard not to buy them! So this was our route from Nanzen－ji all the way to Ginkaku-ji Temple! I hope that you can all find something you like in Kyoto, no matter whether it be temples or food, or indeed souvenirs. 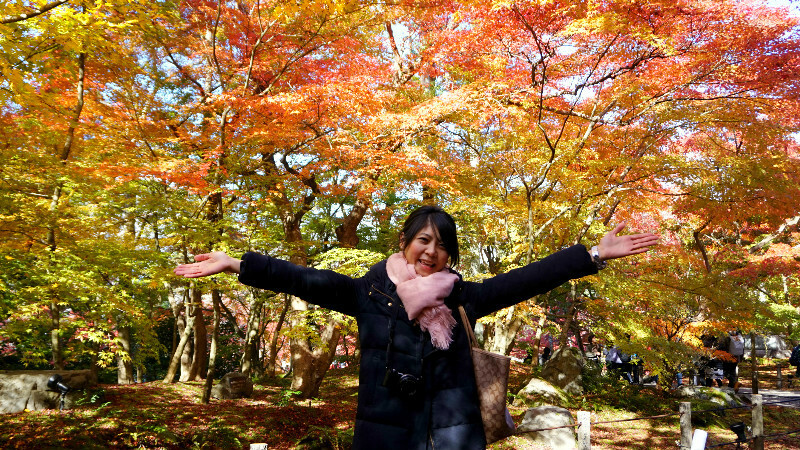 I’m sure that after you have been to Kyoto during the autumn leaves you’ll love Kyoto and its four seasons even more!